Hi and welcome to another sweet feast, dear friends. 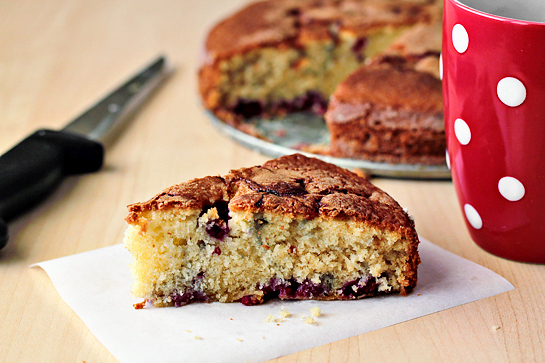 I’ve made a Raspberry Buttermilk Cake for you today. Isn’t it just a lovely way to start a new week? Oh yes, I see you nodding in agreement. It seems I know my readers a little. So what’s this cake about? First of all, it is amazingly delicious and very simple to make – the perfect cake with your morning coffee (or the one in the afternoon). 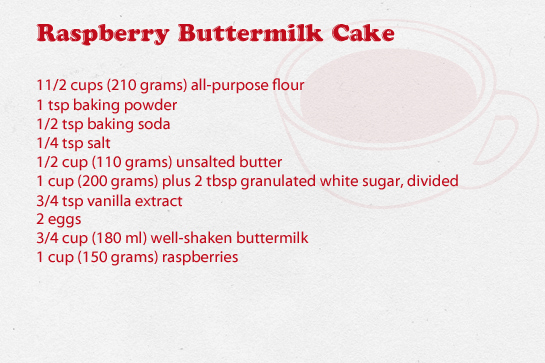 The buttermilk makes it tender in texture, which is nicely balanced with sugary crunch on top. It is full of juicy raspberries, but you could easily substitute the raspberries with any berries you pick up at the farmers market – blueberries, blackberries, strawberries – whichever make you happy. Sounds yummy, right? I know. Here’s our list of ingredients. 1. First, preheat the oven to 355°F (180 °C) with rack in the middle. 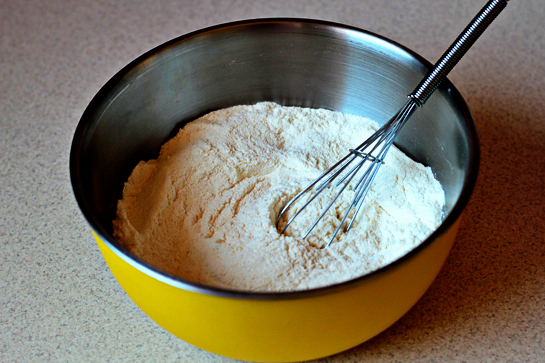 Butter and flour a 9-inch round cake pan. 2. 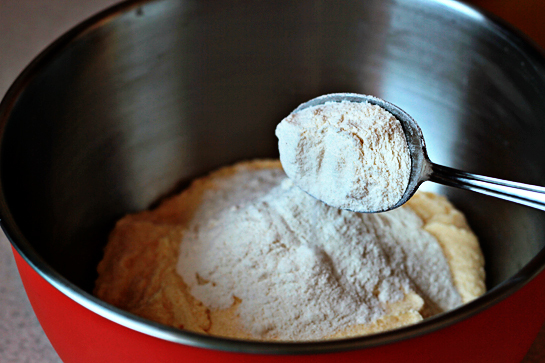 In a smaller bowl, whisk together the flour, baking powder, baking soda, and salt. Set aside. 3. 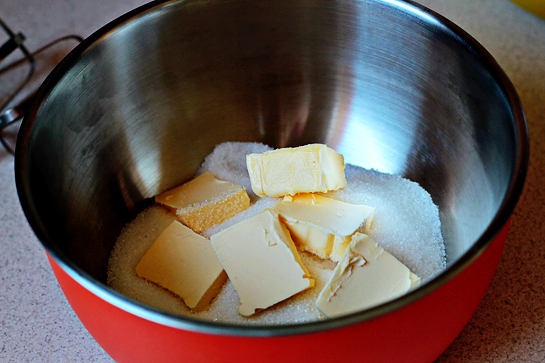 In a larger bowl, beat the butter and 1 cup (200 grams) sugar with an electric mixer at medium-high speed until pale and fluffy. 4. Then beat in the vanilla extract. 5. 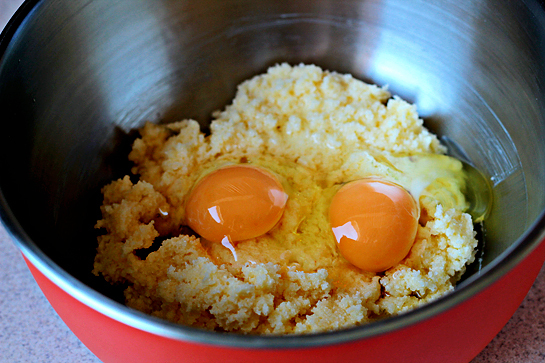 Add the eggs and beat well. 6. 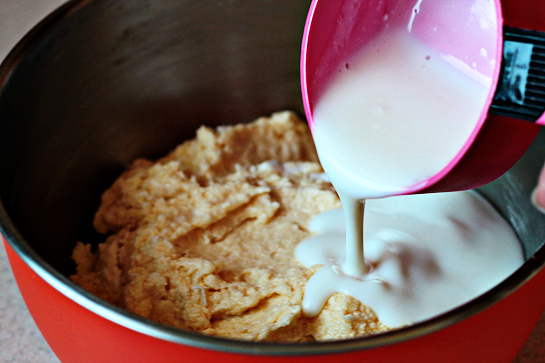 At low speed, mix in the flour mixture in three batches, alternating with the buttermilk, beginning and ending with flour, and mixing until just combined. 7. 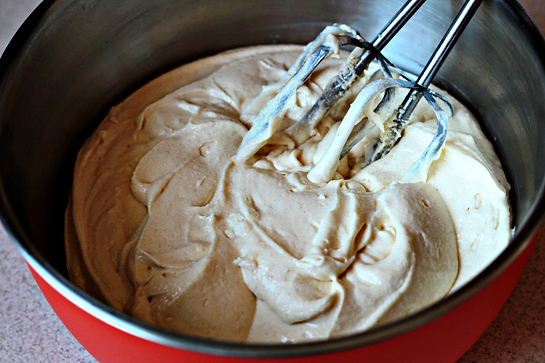 Spoon the batter into the cake pan, smoothing the top. 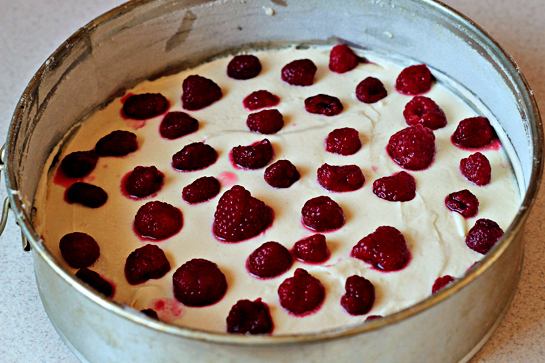 Scatter the raspberries evenly over the top and sprinkle with remaining 2 tablespoons (24 grams) sugar. 8. 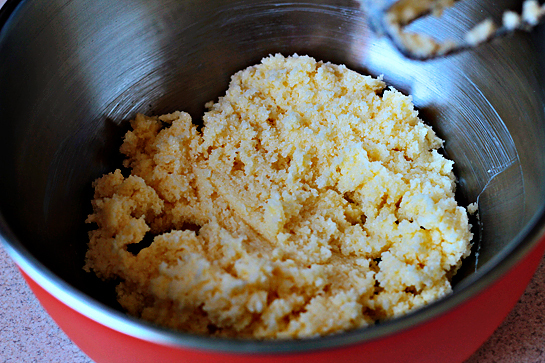 Bake until the cake is golden and a wooden pick inserted into the center comes out clean, 35 to 40 minutes. Cool in the pan 10 minutes, then turn out onto a rack and cool to warm, 10 to 15 minutes more. Then invert onto a plate.